Wawel Castle in Krakow, Poland — Built in the 14thcentury by Jogaila and Jadwiga of Poland the Wawel Castle in Kraków in Poland is composed of many structures situated around the central courtyard. The Gothic castle was constructed on the order of Casimir III the Great, who reigned from 1333 to 1370. Being the residence of Polish kings for cunturies, the castle now serves as one of the country’s premier art museums. Right after WWII and the holocaust in 1945-46 there were pogroms in Poland in which over 300 Jews were murdered. Then during the 1950s the Communist regime headed by Wladislaw Gomulka allowed Jews to depart from Poland. In light of this background, it is understandable that neither Irit nor I were interested in visiting Poland. But a few months ago I read an essay by Stewart Weiss (who writes a weekly column for the "Jerusalem Post" and also leads groups to Poland) explaining why it is germane for Jews to visit Poland. He pointed out that Poland was an important center of Jewish life and culture for a thousand years and Jews should acquaint themselves with their history first hand. Irit and I flew to Warsaw on October 9th which is also Irit's birthday. Fifty-six years had elapsed since Irit last saw Poland. During the weeks prior to our departure I studied the information available on Polish tourism websites but I felt uncertain about many points. Consequently, after landing at Chopin airport we headed straight away to the information office. I got plenty of maps and corroborated the fact that folks over seventy years of age ride the excellent public transportation system for free. There are inspectors who check to see that riders have valid tickets but we encountered only one during our two week stay and he ignored us. The color of our hair gave us away. As we made our way to the Jewish cemetery in Warsaw I observed the people on the street. I did not see any fat people. Most young men and women were tall, six feet or more. Everyone was well-mannered and we did not experience even one negative encounter during our entire vacation. On Sundays, offices, schools and many stores are closed. Families head to the innumerable parks to enjoy nature. I saw many young couples with one child and a few with two children but I did not see families with three or more kids as is commonplace in Israel. I only noticed two black Africans, one in Warsaw and the other in Krakow. Perhaps this is because Poland has a 13% unemployment rate and a minimum wage that is much less than the minimum wage in Israel. I had absolutely no problem getting around because Irit could ask for and get directions in fluent Polish. Indeed, people complimented Irit on her high literary Polish language abilities. Once, when visiting King Stanislaw August Poniatowski's private museum and theater in the Lazienki palace-park complex our guide pointed to the statue of a famous Polish poet. Irit was quick to recite lines from one of his poems. Both Warsaw and Krakow are home to an enormous number of restaurants that display their menus. Irit interpreted these offerings for me. We ate well. Restaurants and food in general were very good and inexpensive. People tended to drink bottled mineral water which was also cheap. Whereas restaurants were omnipresent, I did not see one laundry. In our travels we passed several second-hand clothing shops with many shoppers inside and women on the sidewalk selling old porcelain wear. One news item on the TV claimed that some 7% of Poles are destitute. Besides walking around the old city centers where buildings date from the 15th and 16th centuries, we visited many museums. In one museum we reviewed an exhibit of cartoons that fall into the social criticism genre. In one cartoon there is a street scene in which an APTEKA (pharmacy) is right next door to an ALKOHOLI (liquor store, many of which proclaim that they are open 24 hours a day). Although I did not see any drunks, vodka consumption apparently is significant. The memory of Pope John Paul II is alive and well in Poland. Two main thoroughfares in Warsaw and Krakow are named after him. There are seminaries that organize conferences to discuss the late Pope's thought and theology. TV news items often comment on his accomplishments and there are several John Paul II museums in different cities. In the Oskar Schindler museum in Krakow Karol Josef Wojtyla (the Pope's original name) is cited as having been subjected to forced farm labor by the Germans during the war. Passing through the Schindler museum is a strong emotional experience. This museum documents the cruel barbarism that marked the German occupation of Poland. German inhumanity (slaughtering Jews and enslaving Poles) reached unbelievable depths in Poland. Polish patriotism was also manifest. On the 10th of every month there are commemorative events to recall the Polish Air Force plane crash on April 10, 2010 in a thick fog near Smolensk in Russia. President Lech Kaczynski, his wife Maria and their entire entourage were killed on their way to the Katyn Forest Memorial to commemorate the 70th anniversary of the Katyn massacres perpetrated by the Soviet NKVD under direct orders from Stalin. Twenty-two thousand Polish civilians, soldiers and officers were executed in various prison camps in 1940. The Kaczynski plane crash was discussed on several news programs because there are conspiracy theories that blame the Russian secret services for this event or "accident". Whenever a new piece of evidence is uncovered, TV commentators return to the 'catastrophe' as it is known. We also visited the Military Cathedral of the Polish Army that features a basement museum that includes details of the Katyn massacre. In almost every palace and museum we visited we found groups of school children with their teachers learning first-hand about Polish history in the very building where this history was made. Of course, it was the Polish kings (belonging to different dynasties) that created, for better or worse, this history. 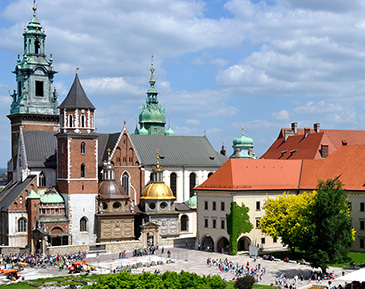 For instance one king burned down part of Wawel Castle in Krakow when his alchemy experiment got out of control. The Polish pupils we observed were always quiet and well-behaved. This sharply contrasts with groups of Israeli high school students we met at our hotel and at Jewish historical sites. Israeli youngsters are loud and uninhibited – a refreshing breeze of Israeli extroversion stood out in Warsaw and Krakow. Israeli tourism to Poland is quite extensive. One day I counted five tour buses on one street in Kazimierz, the Jewish town in Krakow. Besides visiting synagogues and cemeteries most Israelis and Jews in general visit the concentration camps. (Three million Jews and three million Poles were killed in Poland during the war.) Irit and I, however, avoided the death camps as inappropriate tour objectives. One can learn all about the Holocaust at Yad V Shem and other Holocaust museums. On the lighter and brighter side we enjoyed strolling in green and golden leaf parks, riding the efficient trams and buses and interacting with the polite natives. Young as well as older adults instantly gave us their seats on the crowded buses and even refused to take them back when we (Irit) told them that we are getting off in two stops. In the evenings we watched the local TV news. One night, the last item brought me back to Brooklyn. A Polish reporter visited the Green Point neighborhood in Brooklyn where he found Polish food stores and Polish speakers to interview. The Polish community was estimated at 65,000. We had an enjoyable and enriching vacation in Poland. One should, however, first get well acquainted with Polish history before setting out. This is a country that has been repeatedly invaded and trampled upon by Germans, Russians, Swedes and Austrians. Only Hungary is Poland's traditional ally. And the language is not easy. Anatomy of a "Peace Process"
Zvi November, who grew up in New York, served as a Peace Corps' teacher in rural Philippines. He also taught at Hong Kong Int'l School. He earned his diploma from Univ. of Edinburgh, his MA from Syracuse Univ, both in anthropology. Now he is an activist in Israel's Media Watch and other civic bodies.